We walked into the tiny airport and checked in at the front desk. There were no lines, no security measures, and only a couple of other people in view. We took a seat and waited. It didn’t take long until we were greeted by our pilot. After a brief introduction, the three of us went outside to the runway and crawled into a small, four-seater plane, Micah in the front and me in the back. We were about to take a scenic plane tour in Alaska that departed from Homer, and we were bursting full of excitement with a little bit of nervousness thrown in for good measure. Micah and I had always wanted to take a scenic flight during our travels, and our first trip to Alaska seemed like the perfect time for a splurge. During our winter trip to Anchorage, Alaska, we decided to take a road trip south to visit the artsy town of Homer. We spent the night in a cozy cabin, embarrassed ourselves by driving right onto the set of Alaska the Last Frontier while they were filming, met up with a friend from high school, and for a bit of adventure, we added in a scenic plane ride over Kachemak Bay and the surrounding area. Our home base for the night was Glacier Bay Cabins, located just a few minutes out of town. It was secluded enough to make us feel like we were submersed in nature but still close enough to town for easy accessibility. Scenic flightseeing tours aren’t super popular in the winter, but we found Smokey Bay Air was offering tours during the dates we were in Homer. The tours are weather depending, and with the snowy weather we were having all week, things weren’t looking too good. We decided to book the 45-minute scenic tour and hope for the best. Thankfully, the sun came out and the weather cooperated—we were welcomed with a beautiful and sunny afternoon that was perfect for hitting the skies. In addition to flightseeing tours of the surrounding area, you can book bear viewing tours, volcano tours with Smokey Bay Air, as well. The airline also offers multiple flights per day to four small nearby villages for both locals and tourists. Once we were buckled into our seats with our headsets secured over our ears, it was time to depart. Our flight took us over Kachemak Bay, the Kenai Fjords, Harding Icefield, and glaciers. As we soared through the sky we sat with our foreheads pressed firmly against the glass. Views of snowcapped glaciers and mountains and icy waters drifted below us. Rather than seeing these scenes from the camera on our drone, we were actually seeing them with our eyes. The real-life perspective from the air wins, hands down. That is, until our tiny plane started to bounce wildly through the air with jagged mountains not far below. We hit a patch of turbulence and our stomachs lurched into our throats. Our fears were quickly squashed with our pilot’s calm demeanor and assurance that there’s always a bit of turbulence around this area. The pilot told us he flies the same route multiple times every day on his way to and from the nearby villages to transport both people and packages. Knowing this tidbit was certainly comforting and it allowed us to turn our focus back to the icy landscapes before us. In the winter, the landscapes in the Kachemak Bay area are covered in a glistening layer of ice and snow. During the summer months, the landscapes will reveal sights such as lakes, rivers, forests, and mountains. 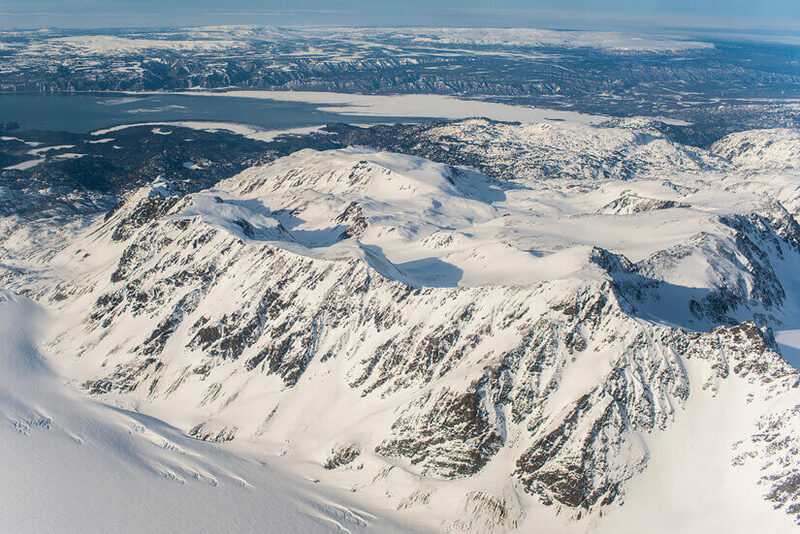 Either way, you are in for a treat—the terrain in Alaska is filled with unmatched beauty, and we are so happy we decided to get an aerial view. This flight cemented our mutual goal to someday each get a pilot’s license, and it is definitely a day we will always remember. 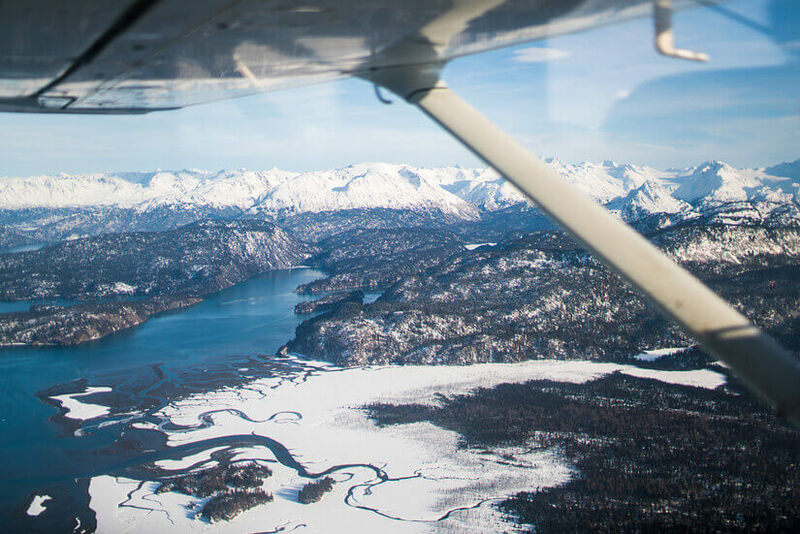 Have you ever been on a scenic plane tour in Alaska or another location? Looks like a wonderful adventure! I’ve never taken a scenic flight, but I have been in a bunch of helicopters for work. I imagine when I get myself up to Alaska, I’ll definitely be taking a scenic flight or two. It was a blast! That’s really neat you get to go in a helicopters for work! Hope you can check a flight out in Alaska sometime!